Toon's Tunes : Aftershock lineup is out, and it rocks! Tickets go on sale tomorrow noon! 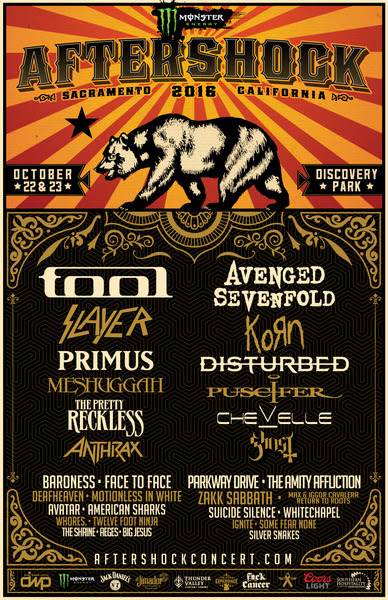 Aftershock lineup is out, and it rocks! Tickets go on sale tomorrow noon! 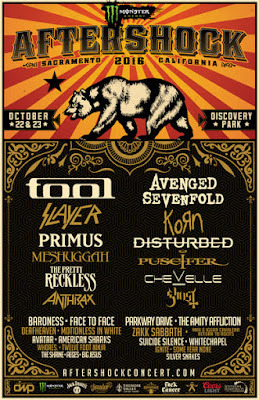 As promised, Aftershock announced the festival lineup today, at midday--and it's looking very, very good for metal fans in October! Remember that these are the early-bird prices: the longer you leave it to buy, the higher the price may be--if they don't sell out first! After the success of previous years' festivals, I would expect to see an early run on tickets; tomorrow, 12 pm, OK? And there's more to Aftershock than two days of wonderful music... as with all the Danny Wimmer Presents festivals, there's not only music, but a lot of other, really-good things that will be happening. Check out the Experience section of the Aftershock website, with info about the Dyin 2 Live/FXCK Cancer organizations and what they do (and see this story from last year's Aftershock), and new this year, Take Me Home animal rescue and Life Looks Good On You... among lots of other good stuff! Last year at Aftershock... are you ready for this year's festival??? Concerned about parking? New this year, you can park at Sleep Train Area and take a shuttle bus to the festival. And there are hotels close to Discovery Park, and in and around downtown Sacramento. Check the website for details. Also worth noting: LTD (Living The Dream) Foundation: A portion of all Monster Energy Aftershock ticket fees will be donated to Living the Dream. LTD Foundation bridges the music industry together with fans who are fighting terminal illnesses by giving them All Access VIP experiences backstage with their favorite bands and artists. It's going to be a good, great, fantastic, wonderful weekend!! !